If you are connected to a golf club and would like to see your course listed please email. 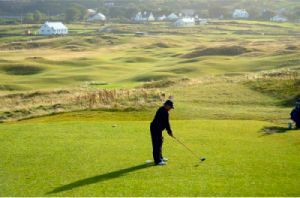 Welcome to IrishGolf.net - a resource for information on Golf in Ireland including golf clubs and courses, news and much more. Narin and Portnoo Golf Club was founded in 1930 when four local men decided that the beautiful warren in Narin had the potential to be developed into a testing yet elegant links. Canon Ernest Devlin, Rev. Boyce, William Hammersbach and Francis J. McLoone saw the fillip to the tourist trade that a golf course would provide and they pooled their resources to rent the land from the five landlords concerned. Improvements were made to the early nine-hole layout and in 1957 the current sixteenth hole replaced the sodden second on the initiative of Louis Walsh. A decision was taken in 1960 to rent more land and on June 24th, 1965 Donagh O'Malley, T.D. opened the new eighteen hole course. Membership improved sufficiently to justify the building of a bigger clubhouse and this was accomplished by Joe McMenamin & Sons, Stranorlar in 1968 with a grant of £6000 from Bord Fáilte easing the financial burden. The club is a par 69 layout with a S.S.S. of 68. There are six par threes and they will make or break a good score. Changes are envisaged in the future which would involve a clubhouse development and a lengthening of the current course, if the members so wish. Whatever the outcome, the club will hopefully retain its friendly reputation in a relaxed and informal setting. Its founders' vision has been justified and the best years surely lie ahead. Presented by: Irish Golf.net - Irish golf course directory, golf club finder.